There was a lot of talk about numbers and colors at Baltimore’s bus stops Monday morning as the city’s newly revamped system of bus routes got its first test. Dubbed BaltmoreLink, the system went into effect in the pre-dawn hours of Sunday, but it wasn’t until the Monday morning rush that planners and riders got the first real sense of it. And Alice McClellan, who uses a cane, was not happy. She was standing at the bus stop at Northern Parkway and York Road, where she used to catch a bus that took her to Mercy Hospital for doctor’s appointments. Now, it stops at North Avenue. "So where’s my link," she demanded. "And according to the link it’s on Biddle Street. That’s too far for me to walk." Lucky for her, the Mass Transit Administration’s Darryl Clark came over to help. 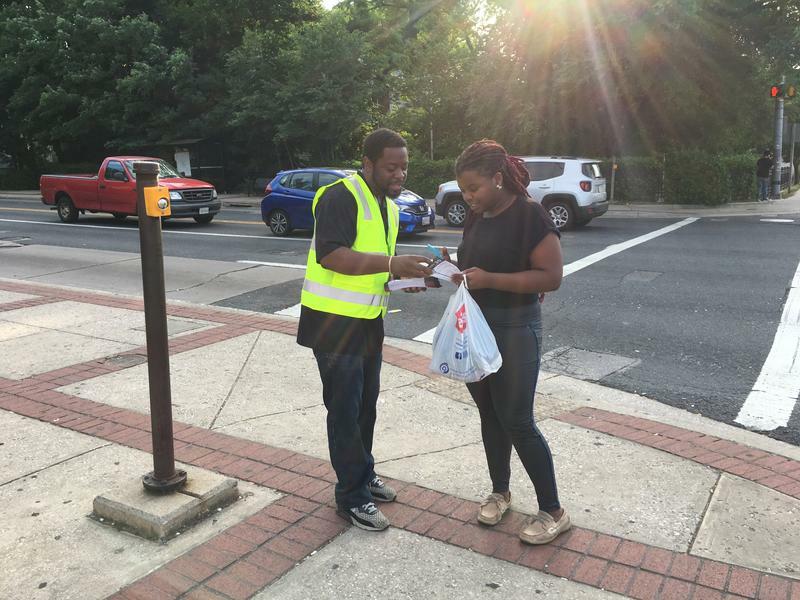 He is one of hundreds of people the MTA has deployed at Baltimore’s major bus stops this week to answer questions about the new system. He started talking to McClellan and the colors and numbers started flying. "To get to Mercy, you just need to transfer to the green route. And that will take you downtown," he explained. "And what is the green route," she wanted to know. "The green route is almost the replacement for the 3. But the 53 comes down the Alameda like the 36 …." A few more directions involving routes and roads and McClellan was good to go to get to Mercy without a long walk. "And they make it seem like it’s so hard,” she said. "It’s not hard. But when you know something’s new, there’s always confusion. So my whole point is, stop fussing and learn what you have to do because it’s not going to change and Hogan is not going to take it back." That would be Gov. Larry Hogan, who announced the $135 million revamping of the city’s bus route system 19 months ago, saying it was broken. There are those who say BaltimoreLink is nothing more than the city’s consolation prize from Hogan after he pulled the plug on the Red Line, a proposed east-west-light rail line from Woodlawn to Johns Hopkins Bayview campus. Regardless, it’s here and Clark is one of the people at the MTA who created the new bus schedules. On the first day of BaltimoreLink in rush hour, part of Clark’s job was to calm people down. "Across the street there was a lady that was very hysterical because the 36 doesn’t run anymore and that takes her straight to work," he said. "But I gave her another option to get there." Throughout the system, routes and route numbers have been changed. Twelve major routes are now color coded. The route that closely follows what would have been the Red Line is now Blue. And there’s another line from Mondawmin Mall to Turner’s Station that’s Navy. The Red Line now runs from Lutherville downtown. Clark says the trick was coming up with schedules, within budget, that took care of everyone, including those who need to catch buses early in the morning or late at night. "And I think we missed a couple of them," he conceded. "And we’ve been getting that from customers, you know in feedback." Bus drivers are getting plenty of feedback as well. Debron Baruch fielded a lot of questions from riders while behind the wheel of the 53 bus on the Alameda. "People are going to be people," he mused. "Some is nice. Some are going to ask questions until they get to know. And that’s what we’re here for the public." The MTA has routes and schedules on line at baltimorelink.com. Or, riders can call 410-539-5000. Naturally, experiences with BaltimoreLink during its first rush hour were mixed. There was Rodney Burnett who was making his way from North Baltimore to Cherry Hill. His first bus came 10 minutes late. "And it didn’t link with the other bus," he complained, "because I saw it going down the street when I got to the corner. So, right now I’m not feeling the link." But a woman on the green line, who didn’t give her name, was feeling it. "The bus is on time," she said. "That’s one thing I like about it. And the air conditioning is on and that’s good." The buses are free for the next couple of weeks while people figure out the new system. Baltimore’s newly revamped system of bus routes got its first real test during the Monday morning rush. And while it’s designed to be quicker and more efficient and to get commuter closer to their jobs, it didn’t go all that well for Rodney Bennett, who was making his way from his home in North Baltimore to work in Cherry Hill. His first bus was 10 minutes late. 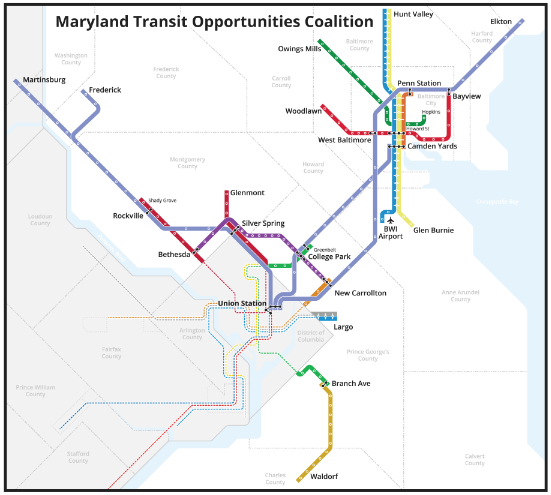 State and local elected officials from the Baltimore and Washington metro areas are calling for a transit network that would connect their respective regions. The policy makers joined activists at a press conference Tuesday morning in front of Baltimore’s Penn Station, gearing up for a political fight that could last through the spring's General Assembly session. The transit system the group envisions would build off MARC and the D.C. Metrorail. It would extend from Martinsburg, West Virginia to the west, to Waldorf, Maryland, to the south, all the way up Elkton, on Maryland’s Delaware line. 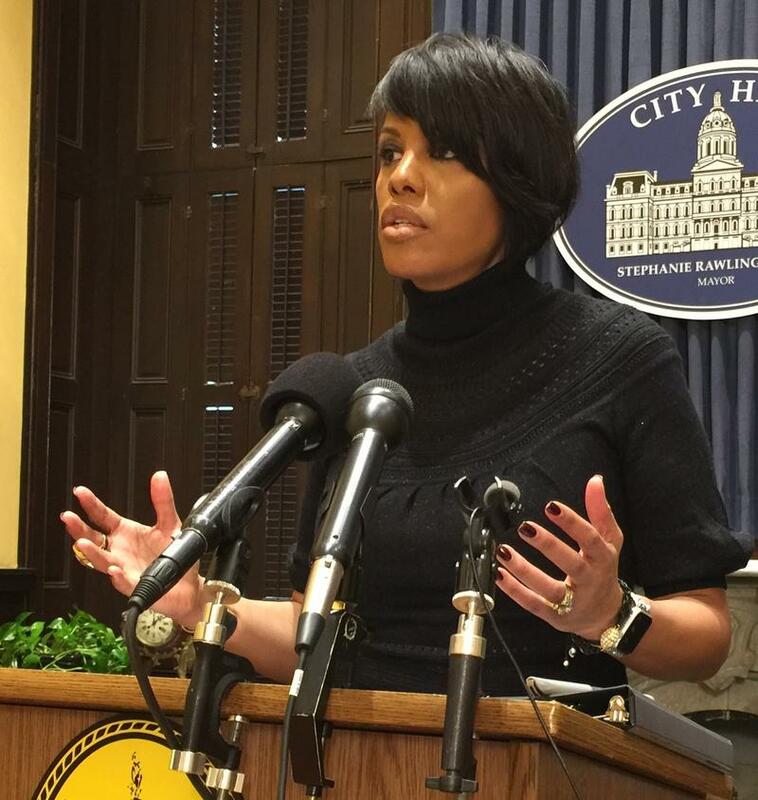 Baltimore Mayor Stephanie Rawlings-Blake said Wednesday that she supports the claim of a coalition of civil rights groups that Governor Larry Hogan’s decision to cancel the Red Line transit project discriminates against African Americans.